This entry was posted in iLom, lom, Midnight and tagged development, Engine, iLom, iOS, iphone, Midnight, programming by Rorthron. Bookmark the permalink. Your reasoning sounds spot on Chris. The simplicity of the Speccy graphics meant that Mike created not only a visual world but one that we imagined ourselves. Funny you should mention Fergus – I was doing one of my periodic loft cleanouts and came across my copy of Bored of the Rings (original yellow cover edition, of course). I seem to recall that that had some pretty good graphics. Did Fergus do those? Yes, Ferg did the graphics for all his games. Btw, if at any stage you need any beta testers or just some feedback on playability or UI, I would be happy to do pitch in. I’ve done beta testing for several games in the past. I’m just going from memory here, and it was a LONG time ago – but limitations or not, there wasn’t much wrong with the graphics in the original, it worked because everything was a line drawing like you’d see in a book. So LOM visually was like a cross between a war game and a ‘choose your own adventure’ book. Reading an earlier post you talked about the transitions as you move through the world and I can see how that poses a problem particularly as you approach an army that starts out as a bunch of banners and needs to become a representation of the troops – have you thought about depicting armies as camps (ie, tents), rather than characters? You could see those from 3 squares away and they’d just need to get a bit bigger and more tents = bigger army. As you arrive one square away, the ‘general’ would ride forward under his banner and a flag of parlay to either talk or fight. Well, I just want to keep it at cheers and support full stop no matter what it will look like, graphically, or how many doomguards will emerge from beyond yonder icy firtree. I guess constructive criticism and bright wishes and insightful pangs just aren’t my thing as an ‘already contaminated beyond sensible rehabilitation’ addict to the “Midnight” universe. Just go on, you can do it, both you, mister Mike S. or the artist. This was always going to be the hard part. The original two games were so evocative. 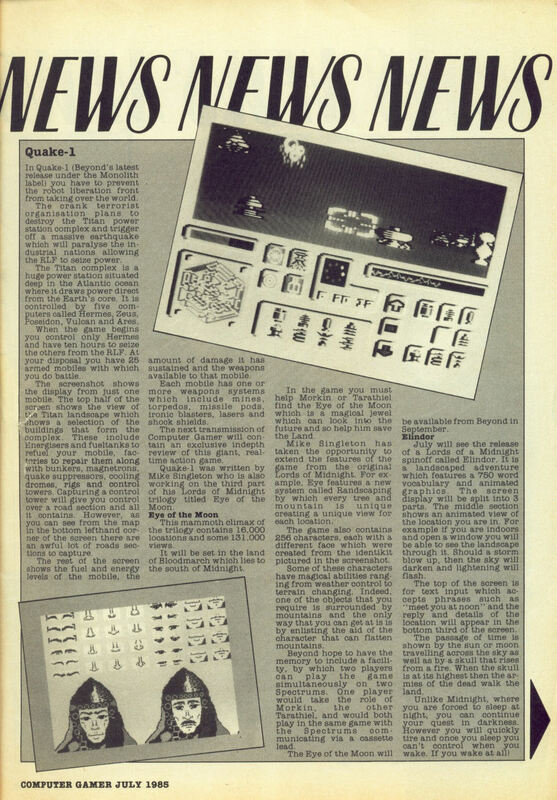 Despite the basic nature of the graphics (though advanced for the time of course), they evoked a very tangible world. Back in 2001, I devoted a huge amount of energy to envisage the world of midnight for a theoretical remake pitch. The costume designs formed the core of my portfolio of a couple of years in fact. For the Free, I dressed them in Byzantine/Islamic armour of the 9th/10th Century: lots of scales with classical flourishes and flowing, decorative silk pantaloons. There was a hint of the Indian Prince in there! The armies of Doomdark were much more Steppe Mongolian in appearance. Doomdark himself wore a long (almost shin length), lamellar coat, splint armour on his arms and legs, and oriental silk detailing. His helmet was conical, with a lamellar neck guard and a learing, Steppe demon style face mask. Both sides shared a similair, coherent armour style, but each had angled it towards their own underlying culture or civilisation. I’m almost 100% sure that no one else sees Midnight like this! And that’s the problem. Midnight is so powerful that the original fans have very firm ideas about how the landscape and it’s people appear. I’m with Marcus Tullius, I just want you to keep going and complete it! fantastic project. Until I read you post I’d missed the point of what was then was actually easier than what is now regards the simpleness of it. So much more is expected today, but at the same time that can be less. Here’s hoping Fergus can assist. It’s also good to see that it’s another name involved that emerged from the same era as LoM and Mike. A quick question. With so much more memory and stuff available, what new features will you be bringing to the game. I assume it’s not just a very straight remake with prettier graphics? Maps maybe? Possible other character types? But again all a danger to the original appeal. Men… ANYTHING AT ALL that You do in behalf of the Lords of Midnight Happy Bunch Company is DEEPLY APPRECIATED by ALL in the above Company. Keep going, you and of course Mike have the love and good will from so many people to see this project through. Whilst I appreciate the need for a modern rethink to the graphics, to have the option to play it as if we were back in 1985/86 is for me something I would treasure above all else. I think this would allow you to be experimental with the new graphics and have a version keeping the look and feel of the original. I hope this is something you would think about doing. This is very good news- the original art was integral to the game, but it wasn’t a 3d game. The view you saw of the landscape was an iconic representational view, that gave you only the information you needed to make your next move clear. When you saw a citadel, you knew immediately it was a citadel from its outline. That’s not to say you can’t add more variety- for instance, having the image of an army more reflect the size of the army so at at distance you can get an idea how large your opponent is. Doesn’t mean you should plot every soldier in the army. And the increased screen resolution can add finesse to the art, without cluttering it up with messy detail. The graphics have to show you what you need to know, convey the atmosphere of the game but leave enough space for you to project your own details onto it. Any news on this? I loved this game on the ZX Spectrum so much. I had a big map I made out of stuck together graph paper. Would happily pay for it. I’d stick to the original graphics – I’ve just bought Fighting Fantasy: Deathtrap Dungeon app and part of the pleasure was it being basically the book. Things are still moving forward, albeit very slowly at the moment. As I said, summer is not a good time for part time programming! 🙂 I’m hoping that momentum will start to pick up soon. There’s nothing to lose in time, after all, it’s been nearly 30 years since the original! The main thing is to get it right. With regard the graphics, we need to get a good midpoint between old style graphics and the capabilities we have at our disposal, and that is going to be a real trick in its own right! Just wanted to add that I would be absolutely thrilled to play Lords of Midnight and Doomdark’s Revenge on my iPhone (and more than willing to pay). Also a big thank you for making two fantastic games that were a huge part of my childhood (I played them on my C64). I too made my own maps with graph paper. I still keep my old Gameboy Advance around just to play the Homebrew versions on that (which I thought were excellent conversions). Would those versions not be best to convert to iOS? It had the original graphics, but with added speed, easy button configurations and also a map. Now that I have found this IceBlog in relation to iOS versions I will definitely keep an eye on further developments with keen interest. It seems an Android version came out a few months back. Looking forward to hearing more about this, Chris. Any chance of an update? Looking forward to this although much prefer the all the different enemies/allies in Doomdark Revenge!! Please let me know the timescale!!! looking forward to this !